Scientists at the University of Nottingham are trying to find out if drinking green tea can aid weight loss. Researchers are recruiting 220 volunteers as part of a 12 week study which will look at how flavanols in the tea affect fat tissue. Half of the group will drink a cup of green tea twice a day, while the others will be given a placebo drink. Those taking part will be aged 18 to 55, healthy, but slightly overweight and will be examined regularly. Professor Ian Macdonald who is leading the research programme, said: "We are not giving our volunteers a diet, although dietary advice can be provided at the end of the 12 week period. "We want to see if green tea affects the amount of body fat someone has, and in particular whether it affects the fat around their waist." Results of the experiment are expected to be released in 2008. 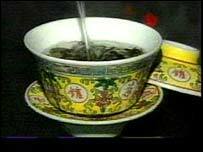 The tea, discovered in China nearly 5,000 years ago, has long been thought to have health benefits. University of Nottingham scientists are trying to find out if Green tea can help you lose weight.